I hate breaking a promise. I also hate rushing things. But if I had to pick one between the two, I guess I'd rush a bit to keep a promise. - I've been busy hanging out with friends and family. - Worked on Saturday, and early shift this week. I will definitely come back and fix this post in the near future. But for now, at least this map shows where the boss is and where to find the Misto plant. - To harvest for the first time, you have to kill the boss first. - It always spawns at the same spot. - It is not always there. You just have to come back later if you don't see it there. 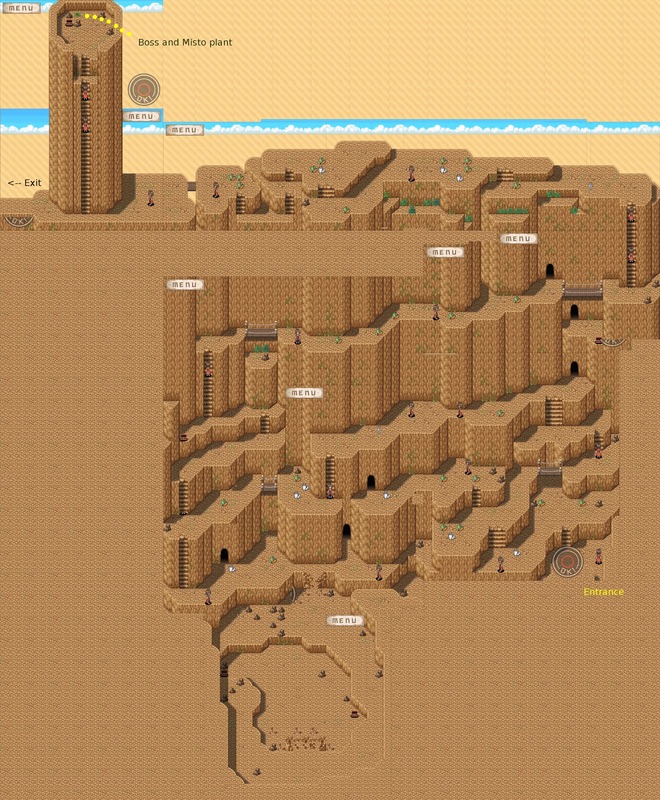 Bottom of the map is where the dragon nest is. It is not there when you first enter this area. As the story progresses, the dragon nest will unlock for you. If you just want to head to the exit quickly, it's okay not to enter any of the caves. - Enna is not a bear. Enna, how to get alter to join the party?? Enna, does misto plant regrow? I've never found it again. I gave my misto plant to the Cassel Garden chef (Anke) and now I haven't made the recipe with it. I mean, does it really regrow? I read on forum it takes 6 days or so to respawn. Testing now to see if its true. so glad i found this informative blog. itz so helpful.. .
Hello Enna, your blog is so nice :D btw why i can't see the boss's hp in Gilbert's Path? Hello, Fred has a skill to see monster HP. If Fred is taken out of the party, you will need a party member to equip a special item to be able to see monster HP. I am not sure if Fred has to stay alive to be able to take the advantage of that skill. I believe you can't see boss's hp with or without Fred. Most games are like that. Makes you go all out all the way until the boss goes down. Made me waste a Bottled Mana when the boss was 1-hit away to die. If it is hard to beat the boss, try eating food that gives bonus like +Str or +Vit before the fight. Of course, not forgetting you Enna. Your blog is truly helpful. Just a question, when or how does the cliff fall down at the bottom of the map of Gilbert's Path? I'm not sure when the cliff would fall. However I heard it happens after you find the first two items for the queen's sickness (tear of earth and catfish ext). It's unlocked about the time you try to heal the Queen, which is close to the ending of the first half of the game. ( This is what I heard, I don't actually remember ), after gathering the first two items for the Queen's sickness ( tea of earth, and catfish ext ), the cliff would fall and the next would be unlocked. How to unlock Gilberts I need to do. To unlock the next map, what you usually have to do is, to kill the boss in the previous map you discovered, and walk out of that map from the exit at least once, or when the bar rank is high enough. For this particular one, you'll have to rank up your bar, and then someone will come and ask you about collecting some special herb. Aww, I didn't do a map for silk reef. >_< But, I know Wind Sleyer is weak against Wind element! ( what a surprise ) Earth element should be avoid. It might even heal the boss. Hey enna is there any way to get dragon meat other than in Gilbert's path? There are other maps available later in the game. You can't really jump the step here. The story will bring you there. Just want to know how to unlock the next dungeon after gilberth's path and if enna is not a bear, what is she anyway.. thanks.. your blog really help. More power to you. I alr get the misto plant but its after 7days anke quest so anke ask to qustav cuz I'm late get it on 7days :'( .Is this mean I lose any progress or I can't unlock next map? Plz answer!!! This is exactly what i want to know !!!!! Just helping here but I need to post my question too. Usually for the story to progress or for an event to trigger, I will usually wait a few days by opening my restaurant and going to town to talk to everyone except the ppl in Cassel Garden and the next available town and harvests. The events will trigger eventually. My question is, is there an easier way to harvest Dragon meat and eggs than grinding cuz it's really tedious. Will the later events unlock selling it. enna u still there ? i just started this game and idk what to do after i done "find misto plant"
i just got new magician/wizard and the queen come to my restaurant. but i dont know what should i do. hello ? there is a people ? can you help me get the misto plant? Me and my brothers are stuck there for days already cant get past it. Do you need to gather that or you need to kill monster for it?